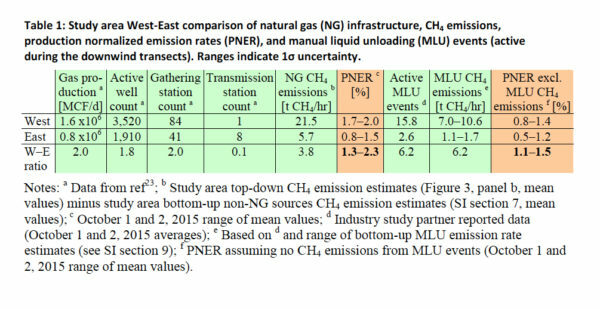 A new peer-reviewed National Oceanic & Atmospheric Administration (NOAA) study suggests emission estimates reported in a series of studies used to justify federal methane regulations may have been significantly exaggerated. The latter research garnered considerable media coverage based on its conclusion that methane emissions from shale gas development were 50 percent higher than EPA estimates, due to so-called “super-emitters.” But a new NOAA study finds that such research relied on air measurements likely collected during episodic maintenance events, which skewed emissions higher than they typically would be. As a result, these “peak” emissions data were inappropriately used to calculate a normal emissions profile. This conclusion is based on the fact that aircraft measurements such as the ones taken for the earlier studies are typically collected around noon in order to get the best readings, according to the NOAA paper. This happens to be roughly the same time emissions from routine maintenance operations typically conducted in the late morning — such as manual liquids unloading — are at their maximum levels in the atmosphere, leading to anomalous emissions. As the orange-tinted columns in the following chart from the NOAA study illustrate, these episodic emissions are substantial – and certainly not reflective of typical emissions. The orange column near the center of the chart shows actual emission leakage rate data collected during the study, while the orange column on the right shows those leakage rates when emissions from manual liquid unloading events are subtracted. The motivation of the NOAA study — the first in a series of research planned in the Fayetteville region — was to better characterize “top down” emission collection techniques in aircrafts with “bottom up” facility-level methods in an effort to reconcile the two methods by combining the two approaches. “Top down” studies typically yield higher emissions than “bottom up” studies, and – as a result – critics have suggested bottom-up studies underestimate emissions. But as the NOAA study notes, not only did those studies assume that the higher emissions detected using the “top-down” method were from episodic and other peak emissions events, they also inappropriately used statistical models to extrapolate these measurements as if they were typical emissions on a 24-hour-a-day, 365-day-a-year basis. The findings of the NOAA study are quite timely, considering the EPA recently issued a 90-day stay on the Obama-era fugitive methane emissions rules – rules that were justified in part by earlier research alleging abnormally high emissions from shale gas development.